We do not grow all of the plants we sell on this website. We purchase some of the dormant bare root plants from commercial wholesale growers or brokers throughout the country, which allows us to offer a wider variety of plants. This is pretty much the same thing your local retail nursery does, however they will pot the bare root plants and grow them for another season and sell them in a non-dormant state. The reason we tell you this now is to prepare you for what you will actually receive and not what you are used to seeing at your local retail nursery. There is absolutely nothing wrong with the plants that you will receive and we guarantee them to be hardy and healthy or they are replaced. It could take until the following season for your plants to recover from the shock of shipping them to you and sometimes they do not recover and this is why we give you a (1) year Replacement Warranty. We provide simplified planting instructions with every order or you can visit our "Planting Guide" webpage (CLICK HERE) for a more detailed version of the planting instructions. With the proper care and our help if you want it, your plants will soon look like the plants a your local retail nursery at a small fraction of the cost! The plants sold on this website will vary in size and although we post an approximate shipping size in each description it is impossible to guarantee a specific size. Most of the plants sold on this website are (2) year plants, in which broad leaf or flowering trees are 2-4 feet in height and shrubs are 1-2 feet in height. 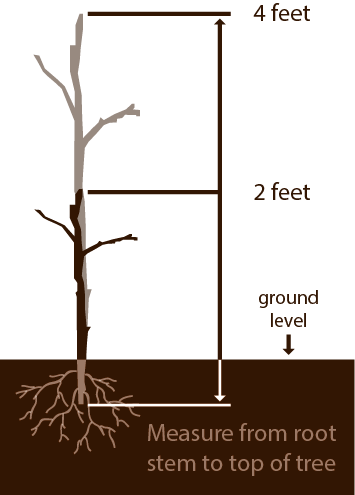 Height is measured from the end of the root stem to the top of the plant. The images we use with the product descriptions are not images of the actual plant that you receive! We provide images of what the plant will look like once you have grown it to maturity. Orders are filled by item number exactly as received. If a variety is sold out, we reserve the right to substitute one of equal or greater value in the same variety. If you are not happy with the substituted item, simply return the entire order within (14) days in the original packaging for a refund. Fox River Valley Nursery does everything possible to ensure that we have low prices and now to show you how much we appreciate your business, every order will receive free plants and to find out how many you can receive Please Click Here. When you place an order we charge your credit card and begin processing your order immediately even if it is months before your order is shipped. This is the only way we can guarantee your shipping position when the shipping season arrives as orders are shipped in the order they are received. Also for your protection we do not save credit card information on our site, so your order is charged in full at checkout and the credit card information is deleted. Once your order has completed the processing stage it will be sent to packing and if plants are available, your order will be packed and shipped immediately and if the plants are not available your order is placed on setback awaiting the plants. In some cases we will ship part of your order if some of the plants are available and the unavailable part of your order will be placed on setback and shipped later. If you cancel your order during processing we will charge a $5.00 cancellation fee. (If an order is cancelled prior to packing a $2.00 fee will be charged for non-refundable merchant bank fees.) Once the processing phase has completed orders cannot be canceled. We reserve the right to cancel any order and refund in full for any reason. We Post a Shipping Schedule on this website with approximate seasonal ordering deadlines and shipping dates. Please note that this is a rough guideline only and these dates could change without notice. The schedule gives you a zone by zone shipping date range and ordering deadline, however it is always wise to check with us before you order because if it is July and we still have dormant stock available in our cooler we might ship the plant before the next shipping season. Always keep in mind that plants must be harvested and shipped in a dormant state or they will never survive the trip to your home and we could not offer the warranty we offer. You might also receive your order in multiple shipments due to availability of dormant stock during your shipping window. The availability of dormant stock is the cause of most delays in receiving plants and is not intentional, so order early to insure you receive your order on time, even if the grower has a bad year with a particular variety. ALL plants are shipped via truck to your local Post Office and your local postal carrier will deliver your plants to your home. We use the USPS Priority Mail Service and the post office will provide a tracking number for their online package tracking system once your order is shipped. You must provide an address where you can receive mail from the post office (PO BOXES ARE ACCEPTABLE) or you cannot receive plants from us. If an address you provide is rejected by the post office we will attempt to contact you and if contact cannot be made within (24) hours we will attempt to ship the plants to your billing address and if we cannot ship to your billing address your order will be cancelled and refunded less a $5.00 fee. NO REFUSALS - Because our plants come with a warranty we ask that you accept all deliveries and if a plant arrives damaged or dead, please contact us immediately. We may ask you send us pictures of the damaged package or dead plants. You may also follow instructions in the warranty policy for a replacement. Orders refused at the door will be cancelled and charged a cancellation fee of $5.00 plus shipping charges. When you order trees from Fox River Valley Nursery, your order is Guaranteed to arrive in a good, healthy condition or we'll replace them at no charge. Your trees will be shipped at a suitable time for planting.